Installing custom headlights is yet another popular and easy modification that can be made to your car or truck to help create the look you want for your ride. There are several types and styles on the market for your car or truck. Our custom parts store offers most of these styles for you in several color variations; some are even available with Halos (angel eyes)! Custom projector headlights are the best headlights that you can install on your vehicle! This is because of the lighting technology that is put into them. Projector lighting systems are housed in chrome, painted, or carbon-fiber backgrounds that will greatly compliment the look of your ride! Projector headlights feature high-tech xenon bulbs that are placed in a "metal cup" that is covered with a thick glass lens that acts as a magnifying glass. Some companies sell projector lighting that uses an inferior and unclear plastic projector lens. All of the projector lights that we offer are crystal clear glass. This glass lens helps project the light in a very wide and distant pattern. Projector lights also feature a reflective shield on the inside of the metal cup that creates super clear even lighting with a sharp cutoff to reduce glare. 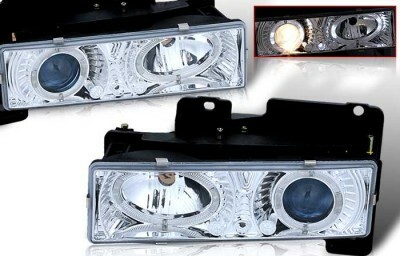 This allows you to have maximum visibility on the darkest of roads, yet doesn't blind oncoming drivers which make this style of custom headlights beneficial to you and other drivers! 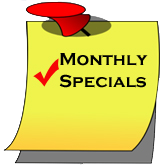 Click here to see the custom projector headlights that we offer for your custom car! Diamond clear headlights, also called Euro clear headlights, are another style of custom headlights that are available to make your ride stand out and improve its lighting performance. Diamond clear headlights feature a completely clear acrylic lens. You'll notice that inside of the headlight housing is a highly reflective chrome background that surrounds the headlight bulb. This backing has hundreds of squares, or rectangles, that are each angled slightly more or less than those they are beside. These small shapes are actually what make the light from the bulb reflect in so many directions to spread, or disburse the light across the road. Conventional headlights use a thick, unclear, and ribbed lens to spread their light. This isn't good because such a thick ribbed lens reduces the amount of light that can pass through and makes them much dimmer than that of diamond clear headlights. Our custom headlights will give your vehicle's front lighting system an ultra-clear, multifaceted jewel-like look which looks awesome during the day! The diamond clear headlights that are offered in our store will really compliment your custom tail lights that you may have already installed on your car or truck! Click here to see the Diamond Clear custom headlights that are available in our custom parts store! Our Sealed beam conversion headlights are used to drastically improve the lighting on vehicles that use low-tech sealed beam bulbs for their headlights. Some examples of cars that use this style of lighting are the old hot-rods with the big flood light style bulbs on the front. Likewise, several imports throughout the years, like the Mazda Miata, have also used this style of bulb. The old style standard sealed beam bulbs are inferior because if the light ever burns out, you have to replace the entire assembly. Plus they aren't that bright to begin with. With our sealed beam conversion headlights, the owner can simply replace just the bulb and not have to throw away and replace the housing as in the old days of automotive lighting. Another benefit of our sealed beam conversion headlights is the ability to use modern high-tech 9003 (H3) bulbs to light up the road even more! The lenses on our sealed beam conversion kits are constructed of crystal clear glass and feature multifaceted chrome reflectors to produce more than enough light. Our sealed beam conversion kits are 2-3 times brighter and clearer than any standard sealed beam headlight unit! 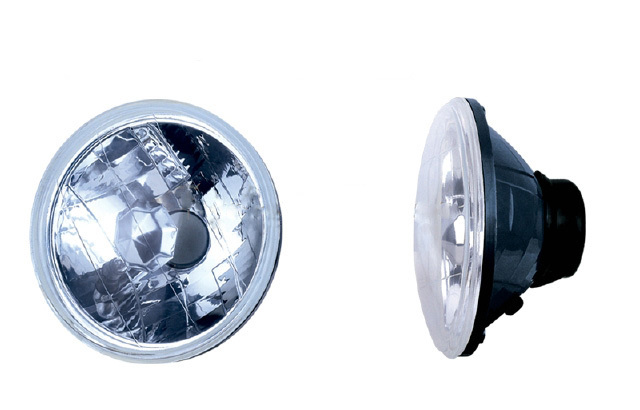 Our lights also feature 194 bulbs that can be used as additional parking lights or as turn signals. These 194 bulbs are mounted directly into the headlight housing for an awesome look! Several sizes are available in our custom car parts store. 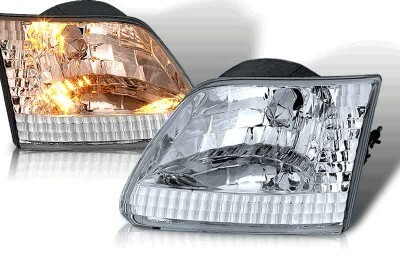 Click here to view the sealed beam conversion kits that are offered in our custom parts store!